Oh! A new year, 2018 will come soon! This time, I will introduce the executive committee of the International Piano Competition for Left-hand. This competition will be the world’s first competition. Today, we had the meeting of this committee. 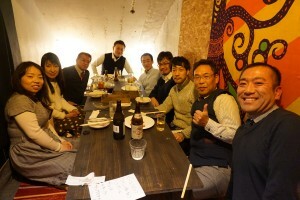 In addition to left hand pianists, brains related to Minoh-city belongs to this committee. The preparation for this is progressing steadily. We reconfirmed our purposes that ‘we want to spread the world of music for left-hand’. Also we swore to make an effort for 2018 (this year will be the last year of Heisei! ).